It is unlawful for anyone to drink from or possess an open container of alcohol while in a motor vehicle that is on a public road. Failure to adhere to this law will result in negative consequences for the driver. When should you drive in a lane underneath a lane use control signal displaying a red X? 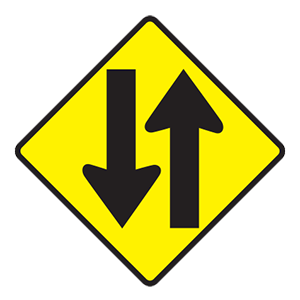 Lane use control signals are used when the direction of the flow of traffic in a specific lane changes throughout the day. They are used to show which lanes of traffic are open and closed, as well as to show if toll booths are open or closed. Never drive in a lane controlled by a red X. You can travel in either direction in this lane. You are approaching a divided highway. This sign warns of two-way traffic.